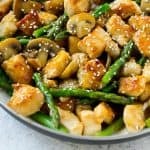 A stir fry full of chicken, fresh asparagus and mushrooms in a light sauce. Heat 1 teaspoon of oil in a large pan over medium heat. Add the asparagus and mushrooms and cook for 2-3 minutes or until just tender. Add the garlic to the pan and cook for 30 seconds more. Add the remaining tablespoon of oil to the pan. In a bowl whisk together the oyster sauce, chicken broth, honey, sesame oil, and soy sauce. In a small bowl mix the cornstarch with a tablespoon of cold water.